Franklin privacy screen Archives - Nashville Irrigation Estimate Design Installation Repairs for Nashville, Brentwood, Franklin, Spring Hill, Nolensville TN Tennessee areas. How can I get my Nashville privacy screen of Green Giant Arborvitae delivered and installed at my home? Call us for an estimate and we will deliver your Nashville privacy screen and install 6 8′ tall Green Giant Arborvitae at your home. What does this privacy screen delivery and planting cost? What does my Arborvitae privacy screen come with? This includes a compost and soil mix to be amended into the soil of the planting hole and brown hardwood mulch over the top of the soil. The only guarantee we are offering is that if your plants have anything wrong with them at the time of planting we will replace that one at that time. There is no long term warranty or guarantee. 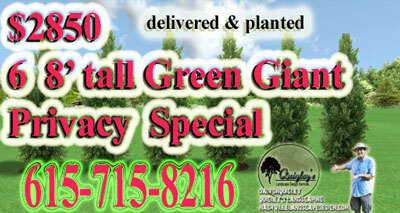 Call us at 615-715-8216 to order your privacy screen planting of 6 8’tall Green Giant Arborvitae. Visit the contact page here. Nashville Sprinkler and Irrigation Company Dalton Quigley Copyright © 2019 Nashville Irrigation Estimate Design Installation Repairs for Nashville, Brentwood, Franklin, Spring Hill, Nolensville TN Tennessee areas.